Finally, we owe many “famous firsts” to Augustine. His Confessions represent an early example of how to give testimony to encourage other believers. This also led Augustine to articulate a view of predestination that would dominate later Western Christianity, in which God graciously chooses to save some of the mass of human beings guilty of original sin. 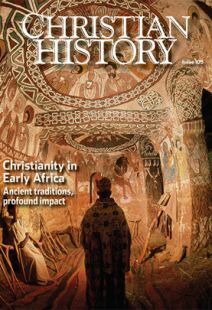 Making your way around early African Christianity means learning about Christian groups new to many Westerners. Early Africa included both Latin-speaking (Western) and Greek-speaking (Eastern) Christians. The Eastern or “Byzantine” half of the Roman Empire, headquartered at Constantinople in Asia Minor, spoke Greek. Eventually, its churches and the churches headquartered at Rome divided. But long before that, early Christians were debating issues regarding the divinity of Christ and the relationship between his human and divine natures in ecumenical councils where church leaders came together. One, at Chalcedon in 451, wrestled with how Christ’s human and divine natures related. It declared that although Christ was one person he had two distinct natures. Some Christian traditions, whose stories we tell in this issue, rejected Chalcedon, declaring that Christ had a single nature which was both human and divine. Today, you will sometimes hear these churches called “Oriental Orthodox.” They are separate from the Eastern Orthodox Church (which accepts Chalcedon) and include churches in both Egypt and Ethiopia (see “From Abba Salama to King Lalibela” pp. 18–21, and “Some others you should know,” pp. 36–37).